Goat cheese and asparagus...both are crazy delicious and when they come together, it's just ridiculous. I made this tart for my daughter's preschool Halloween breakfast party. Not the prettiest thing but it was pretty tasty. A nice start to the day! When it has softened, place the dough into a 10 inch non-stick tart pan with a removable bottom and spread out the dough with your fingers until it fits the pan all the way up to the edges. Then leave it the fridge until you are ready to use. Place trimmed asparagus on a baking sheet and drizzle lightly with olive oil and a very light sprinkling of salt. Use your hands to toss until asparagus is evenly coated in olive oil and salt. Roast asparagus in the oven for 8 to 10 minutes, depending on thickness. You want asparagus to be tender but still have firmness. Set aside and allow to cool while preparing other ingredients. Beat the eggs, cream, thyme, 1/2 teaspoon salt and 1/8 teaspoon pepper in a bowl with a whisk until completely combined. Cut each asparagus spear in half and arrange them in the pie dish, until the bottom is evenly covered. Sprinkle the goat cheese evenly on top of the asparagus. Finish off by pouring the egg mixture on top until it fills it completely without overflowing. Place on a baking sheet (in case there is overflow) and into the oven for about 35 to 40 minutes or until the egg mixture is firm and the top is a golden brown. Don't overcook. Let rest for at least ten minutes. Carefully lift the tart out of the pan and onto a large plate. Cut into 6-8 pieces. Serve hot or room temperature. I'm getting ready for a play date this afternoon. My 4-year-old daughter's favorite friend from school is coming over and it's a BIG DEAL. Let's just say she's borderline obsessed with her. She's been begging to have this lovely little girl come over for weeks now and has been on the verge of exploding with excitement ever since I told her a couple days ago that it was was going to finally happen. I am baking the girls some blueberry muffins. I found this recipe on the web. Hopefully they will turn out good and I won't embarrass my daughter. Haha! UPDATE: So the muffins turned out great! Absolutely delicious. The play date was a success as well. My daughter's friend does not like blueberries. Doh! Prepare a 12-cup muffin pan by spraying well with baking spray or line each cup with a cupcake liner. In a medium bowl, whisk together the flour, baking powder, and salt; set aside. Using a fork, mash 1/2 cup of blueberries; set aside. In a small bowl, mix together 1 tablespoon granulated sugar and nutmeg; set aside. Using a hand mixer, cream butter and 1 cup sugar together in a medium bowl until creamy and light in color; add eggs, vanilla, and 1/2 cup of mashed blueberries. Add 1/2 of the flour mixture; mix just until the dry ingredients are incorporated. Add 1/2 of the milk and mix just until combined. Repeat with the remaining flour mixture, followed by the remaining milk. Fold in the remaining whole blueberries. Portion batter evenly into muffin cups and sprinkle with sugar/cinnamon topping. Bake 25-30 minutes, until a toothpick comes out clean. Mary's Note: Mary says you can freeze the muffins for up to two months before baking - portion the batter into foil-lined muffin pan and place in the freezer until the batter is firm, then pop the frozen muffins out of the pan and store in a freezer-safe container. When you want freshly baked muffins, simply pop the frozen batter-filled foil cups back into a muffin pan and bake as directed; adding 5-6 minutes to the total baking time. 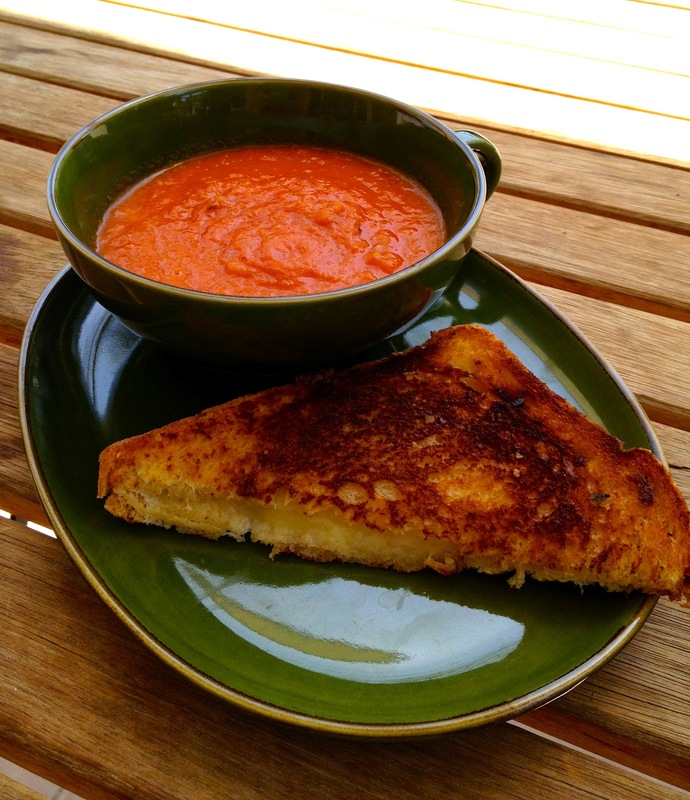 Like milk and cookies, grilled cheese sandwiches and tomato soup go perfectly together. For me it's the slight tartness and sweetness of the soup that cuts the richness of the ooey-gooey cheese and buttery bread oh-so nicely. I'm not a huge fan of the canned tomato soups I've tried though. They barely taste like real tomatoes and can be sickly sweet. This is my second attempt at a homemade version. I think it's definitely worth the effort. Once you try it, you really can't go back to canned. Line a large roasting pan with parchment paper. 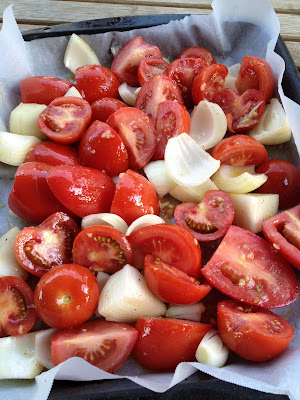 Add the tomatoes, onion and garlic. Drizzle with the olive oil and sprinkle with a 1/2 teaspoon of salt and 1/4 teaspoon of pepper. Toss gently with your hands until all the veggies are evenly coated with olive oil, garlic, salt and pepper. Roast in the oven for about 40 minutes. The tomatoes and onions should be starting to brown and blister. Let cool for a few minutes. Pour the roasted veggies with all of the juices and a cup of the chicken stock right into a large stainless steel pot. Use an immersion hand blender to blend the veggies until almost smooth, adding more chicken broth to thin the soup out until the consistency is to your liking. The key is to tilt the pot to the side in order to get the liquid high enough to blend without everything splattering! Heat over medium-high heat until it comes to a low boil. Then turn down the heat and simmer for about five minutes, stirring occasionally. Season to taste with salt and pepper. Add a pinch of sugar if it needs a touch more sweetness. Serve hot. *If you don't have an immersion hand blender, a large food processor or blender works just fine. Pour the roasted veggies with all of the juices and a cup of the chicken stock into a large food processor and pulse until almost smooth. Add more chicken broth to thin the soup out until the consistency is to your liking. Then transfer everything to a pot and heat over medium-high heat until it comes to a low boil. Then turn down the heat and simmer for about five minutes, stirring occasionally. Season to taste with salt and pepper.